The eagerly awaited blockbuster computer game, Doom 3, has been leaked on the internet. Copies of the game on file-sharing networks and newsgroups are being downloaded by thousands of people. The cost to the game's makers, id Software, could run into hundreds of thousands of pounds in lost sales. The sci-fi horror title has been four years in the making and is due to go on sale in the US on Tuesday and next week in the UK. 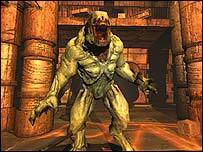 Doom 3 is the second follow-up to the 1993 first-person shooting classic. Developing a game like it can cost game developers like id Software in the region of $15m (£8.3m) to $20m (£11.1m). Its release is the gaming equivalent of the third film in the Lord of the Rings trilogy. In the US, the game is expected to retail for $54.99 and is expected to sell in the millions. Some US stores are planning to officially start selling the game on Tuesday, but copies are reported to have appeared in a few shops over the weekend. Potential sales could be hit by the extent of online piracy of the game. Copies of it appeared on newsgroups and peer-to-peer networks over the weekend. At one point on Sunday, more than 50,000 copies of the game, which weighs in at more than 1.5 gigabytes, were being downloaded. Translated in lost sales, this amounts to $2.7m (£1.5m), if all these people instead bought the game. "Despite the relatively low price of PC games, many gamers are still choosing to resort to piracy rather than pay for legitimate boxed copies," said Matt Pierce, publisher of the computer games magazine, PC Gamer. "Since Doom 3 is one of the most eagerly awaited PC games ever, it was almost inevitable that it was going to be leaked online following its US release. "Whereas in the case of Doom 3, it almost certainly won't prevent the game being a massive seller, it will still cost both the publishers and developers of the game millions of dollars in lost revenue, an outcome that can only serve to harm future game development on the PC," he told BBC News Online. At the time of publication, no one was available to comment from the game's publishers, Activision. In Doom 3, gamers play the part of a marine on Mars, facing a horde of demons released from hell by scientific experiments. "Doom 3 is a video game experience unlike any before it," said Todd Hollenshead, head of id Software ahead of the game's release. "From the cinema quality visuals and the incredible 5.1 sound, to the terrifying atmosphere and hyper-realistic environments, the whole game screams 'interactive horror film'. "Add in the most ferocious line-up of demons hell has ever brought to bear, and you have an experience so intense that you'll need to keep your heart medicine handy." The original was a ground-breaking game. 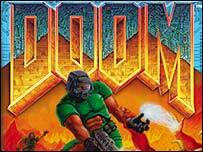 Doom drew players into a three-dimensional virtual world where they had to battle monsters. It helped to establish the concept of the first-person shooter, in which gamers see the world through the perspective of the lead character. The PC version of the game goes on sale in the US on Tuesday and on 13 August in the UK. A version for Microsoft's Xbox is due later in the year.